The synopsis below is reprinted from A Complete Catalogue of Bloomsbury Heritage Monographs 2009. Virginia Woolf’s frequent discussion of weather in her essays and her use of weather in her novels has consistently and inexplicably been overlooked by scholars and critics. In her non-fiction Woolf develops theories about the role weather could and should play in fiction. In her diaries, she discusses the part weather plays in her own day-to-day life. And in her novels, she utilizes her theories about the way weather influences and reflects her characters. 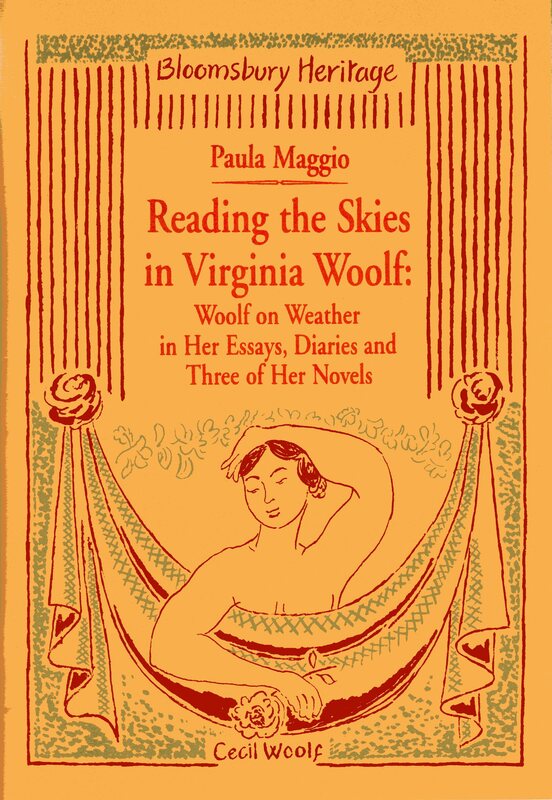 Why, then, if weather is so important to life and thought, particularly British life and thought, asks Paula Maggio, has it been neglected in analysis of Woolf’s writing? In this important and highly readable monograph, Maggio explores the development of English thought about weather, and how those ideas influence Woolf’s theories about writing included in her essays. She discusses Woolf’s quintessentially English fascination with the vagaries of the nation’s weather on her own life as a diarist and reader, and shows how she uses her weather-related theories in three of her novels, Mrs. Dalloway, To the Lighthouse and Orlando. Details: Demy 8vo. card covers, 48pp. ISBN 978-1-897967-99-7. Price: £7.50 from Cecil Woolf Publishers. Contact Cecil Woolf at cecilwoolf@gmail.com or at 1 Mornington Place, London NW1 7RP, England, or tel/fax 0044 207387 2394 to purchase a copy of Reading the Skies in Virginia Woolf and other monographs in the Bloomsbury Heritage Series or the War Poets Series. Alas, the previous comment was garbled. The last line (the quotation from Genesis) was proceeded, when I clicked on “Post Comment”, by a note saying there is indeed an appendix with quotations having to do with weather from a range of other books, ending with the quotation from Genesis. << It rained forty days and forty nights.—Genesis.